A Bellows can be an integral or optional part of a photographic camera and serves as alternate lens tube or lens tube extension. 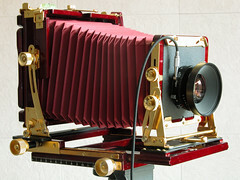 For photographing, a bellows has to be expanded to its working length. 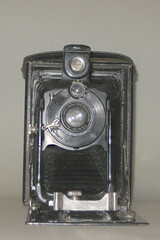 Most bellows cameras have a front door upon which the bellows unfold when the door's opened for camera usage. More sophisticated bellows cameras allow one to fix the bellows in various positions to optimize the image plane for special applications like architecture photography. 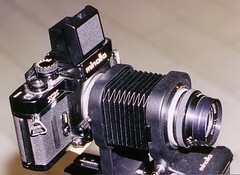 As an optional part of a camera with exchangeable lenses, a bellows can extend the lenses' capabilities to make images of small objects at small distances by extending the lens tube's length. Such a bellows can be fixed at any length as the length of its guide rail(s) allow. The average folding camera unfolds its bellows to a fixed length. Some models with exchangeable lenses allow different bellows expansion lengths. 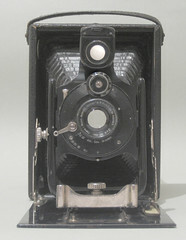 Some sophisticated amateur cameras allow tilts and shifts, but in most amateur cameras the bellows is just optimized for the compactness of the folded camera. Bellows for macro photography with modern SLRs are geometrically more like accordion bellows than like typical built-in camera bellows. That means a macro bellows has an equal diameter throughout its length. 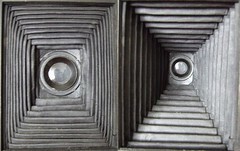 The bellows of professional view cameras are also accordion-bellows-like or with only little reduction of diameter towards the lens mount plate. That gives these bellows better flexibility for tilting and shifting the lens to reach optimal image geometry and sharpness plane. But some amateur plate cameras offer such lens board flexibility too, despite of non-accordion bellows geometry.